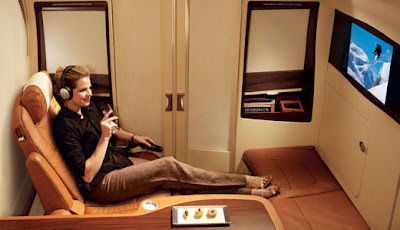 Traveller's Tales: Worth Flying First Class? It is so expensive to fly first class, that sometimes I wonder if people have that much money, aren't they just chartering a private jet? My only first class experiences have been on domestic flights, where the only real difference is wider seats and good food. But, now, most American airlines don't have first class anymore. Never flew first class... to me, it just doesn't worth the money. THe price difference is so huge ! That's awesome... I want to work for your company. Mine made me fly from Minneapolis to London in coach. Several times. The last time my team mate sat with me.. we took our seats, he looked at me smiled, swallowed a pill and didn't wake up until we were on final to Gatewick. @foodette: Exactly. Delta and Virgin only have Business Class and Coach. In fact, only Singapore Airlines (and some of the Airlines in the Gulf countries) seems to have a decent enough First Class which offers some differenciation over Business. As Richard Quest said in one his shows recently on CNN, you travel on first class not for luxury & not for comfort. You are paying for the inalienable right to be recognised as being able to pay. Which, since time immemorial, has been called 'Status'. If you need it, you pay for it. As Quest put it, 'punk rockers, movies stars and just the seriously rich' seem to want it. So First Class works well on sectors they frequent, for instance in and out of LA. As for the rest of us, well, if you want to sit next to one of the above, it is probably a worthwhile investment. If you just want luxury & comfort, Business should do. Oh man... that bed! 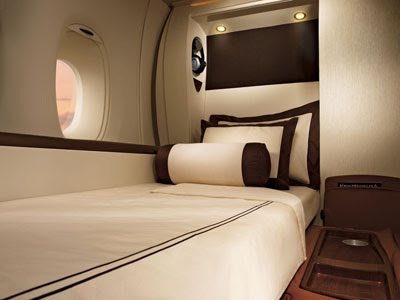 I have never flown first class... just because I can't afford it... :( if I could, I would ... look at that bed!!! @sig: Like I said, another reason to want to make more money! I'd rather take a vacation twice, what with first class costing so much, unless of course the company wants to pay the air fare. @indicaspecies: Welcome to my blog. Yes, exactly. I've experienced first class on a Virgin plane and I believe you pay for a brilliant personal service. The crew are very attentive and get you any drinks etc you want for no extra cost. You also get comfortable seats which turn into flat beds making it easier to sleep on night time flights, and silver service (no plastic cutley that snaps). I felt refreshed upon reaching the UK from the US. It is expensive but I enjoyed it and if you book early enough you can save a lot on the cost - we paid £300pp rather than £1400pp on the day.